Not many people enjoy going to the dentist but it can be a real problem for people with communication disabilities. Recently I wrote about using Talking Mats in a care home to find out the views of an elderly lady with communication difficulties and dementia who had lost her dentures. click here. Using the mats, she was able to tell us that she was unwilling to open her mouth but thought that if someone was with her she might manage better. 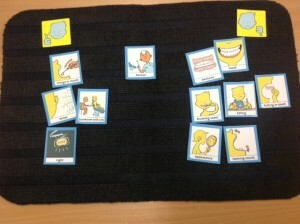 Following our Talking Mats conversation the Care Home arranged an appointment with the dentist for the following week. Her son went back over what we had talked about just before the visit. She managed fine, opened her mouth and her treatment was carried out successfully. Her new dentures are on the way! Dentistry is a huge problem for many people, but the impact of not being able to cooperate can have serious implications for a person’s appearance, comfort, quality of life and health. In preparing for a visit to the dentist it’s important that the person understands both what is going to happen and why its happening. Talking Mats is a visual tool that can help the person with communication difficulties both with understanding and also expressing their views. In this way the family and carers can find ways to reassure the person and support them to get the appropriate dental treatment. Please let us know your thoughts on supporting people in similar situations. This entry was posted in Blog, Communication difficulties, Dementia, Participation and tagged Communication difficulties, Dementia, Participation, Talking Mats on January 29, 2014 by Joan Murphy. The Talking Mats Team is increasingly asked to help ascertain a person’s capacity to express their views from a non-biased perspective. We are also asked to carry out service evaluations and are therefore developing independent consultancies to individuals and organisations. Our team of experienced Speech and Language Therapists, who have an in-depth knowledge of communication difficulties, are well equipped to do this. A Social Work department asked us to work with a woman with dementia and aphasia who had been sectioned. They needed to ascertain if she could understand why she could no longer live in her own home. We worked closely with her social worker and through using Talking Mats ascertained that she was unable to give informed consent. A Health Service facility asked us to evaluate the degree to which their patients felt involved in their care planning. This entry was posted in Adult protection, Blog, Capacity, Child protection, Communication difficulties, Dementia and tagged capacity, Dementia, Personalisation, Talking Mats on January 17, 2014 by Joan Murphy. Can Talking Mats help people with Multiple Sclerosis? Talking Mats is one tool which can help people recognise any problems they may be having. It also provides a sensitive way for people to discuss these issues and plan ways to manage their situation. The Learning and Thinking topic is particularly relevant. The following is an example of a Talking Mat done with Stella who has MS and lives at home with her husband and 3 children. Stella began by putting most of the option symbols between the Managing and Need some help columns. However as more symbols were presented, she took time and thought about each symbol more carefully and changed her mind about many of them. She said that using Talking Mats helped her realise that she was having some problems. On completion of the mat, she showed it to her husband and together they discussed practical ways of ways of managing her difficulties. 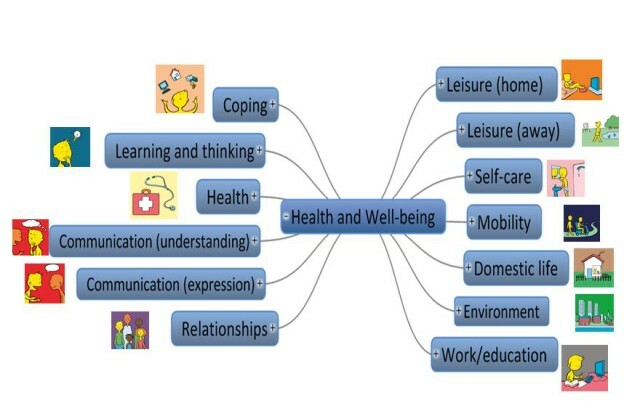 There are a further 12 topics in the Health and Well-being resource that can be helpful to people with MS. these are available either on our app or as Talking Mats original. This entry was posted in Blog, Communication difficulties, Multiple Sclerosis, Participation, Self directed care and tagged Communication difficulties, Participation, Self directed care, Talking Mats on January 7, 2014 by Joan Murphy.